Sometimes history is driven forward by an accidental coincidence of circumstances. In 1830, when HMS Beagle was exploring the maze of channels and fjords at the southern tip of South America, one of the ship's boats was stolen by a group of natives. Her notoriously short-tempered captain, Robert FitzRoy, seized four young natives as captives. Since the boat was not returned, he considered himself justified in keeping his hostages, and embarked upon a curious social experiment. He dressed the three young men and one young woman in western clothes, taught them English, and eventually brought them back to England, his purpose, as stated in his journal, being that they should "become useful as interpretors, and be the means of establishing a friendly disposition towards Englishmen on the part of their countrymen." 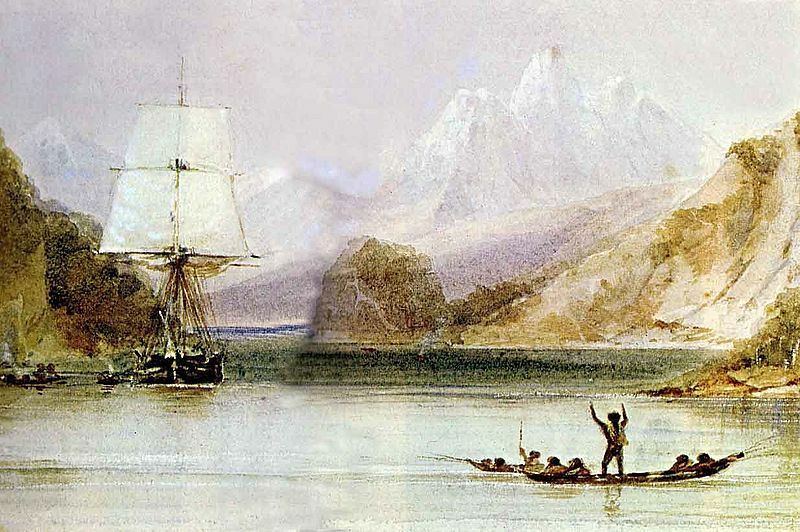 "HMS Beagle at Tierra del Fuego," by Conrad Martens (image is in the Public Domain). 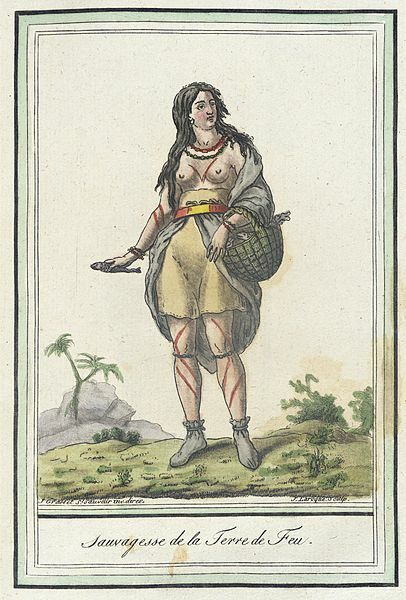 "A Savage woman of Tierra del Fuego," by Jacques Gasset de Saint-Sauveur, 1797, Los Angeles County Museum of Art (image is in the Public Domain). One of these Yamana people died of smallpox shortly after arriving in England, and is known only by his English given name of "Boat Memory." The others, O'run-del'lico ("Jemmy Button"), El'leparu ("York Minster") and the girl, Yok'cushly ("Fuegia Basket"), received a brief education in England, and an introduction to the principles of Christianity, and were ultimately presented to William IV and Queen Adelaide. "Two studies of Jemmy Button," from FitRoy's journal (image is in the Public Domain). It had always been FitzRoy's intention to return these young people to their homeland, where they would play a part in the "civilising" of their fellows, but the Lords of the Admiralty were less enthusiastic about funding a return voyage. FitzRoy had taken (by any modern standards, "abducted") these young people on his own initiative, and they were therefore his problem, not that of the Royal Navy. He seems to have been resigned to the funding of the journey from his private fortune, but he was a well-connected aristocrat (descended from one of the bastards of Charles II), and someone pulled strings, securing the required funding from a reluctant Admiralty. 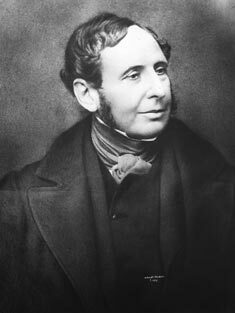 Robert FitzRoy, National Library of New Zealand (image is in the Public Domain). Aware of his own depressive tendencies, and of the suicide of his predecessor as captain of the Beagle, FitzRoy insisted on having a companion to share his cabin and table: a naturalist would be ideally suited to the role, a university-educated gentleman who shared his own scientific interests (FitzRoy himself was a noted pioneer of meteorology). That naturalist was, of course, Charles Darwin, and his five-year voyage around the world on HMS Beagle would inspire the theory that went on to transform our understanding of the natural world, and of our place within it. Sylvia Iparraguirre's novel, Tierra del Fuego, is not about Charles Darwin (he appears only as a minor character). It is primarily about the very different journey of O'run-del'lico ("Jemmy Button"), but Iparraguirre has cleverly chosen to narrate it from the point of view of a fictional Argentinian seaman, John William Guevara, who joins the Beagle's crew on the first voyage, befriends O'run-del'lico, and shares his experiences of England as an unfamiliar land, returning with him on the second voyage. It opens with Guevara in Argentina, many years after the Beagle voyages, receiving a letter from an Admiralty clerk, asking him to recount his experiences of contacts with the Yamana, and his account is, in part, addressed to this clerk. 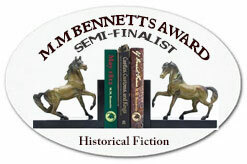 It is one of those historical novels in which fact and fiction are so skilfully blended that one is drawn to check what is real and what is invention. "I notice a certain symmetry between you and me, Mr MacDowell or MacDowness, between your letter and what I write. I can't figure out your name; mine must have puzzled you. Who, then, is the one writing? ... The one who recalls these events and writes is John William Guevara, fifty-three years old, born in a part of the flatlands of what today is called the Argentine Confederation." "The port [London] was a pandemonium ... Ships with unfamiliar flags, enormous warehouses where the shipping clerks shouted at the top of their lungs, shipments, people from every country, and of all races: Negroes, Hindus, Chinese ... Button had long ago used up his capacity for astonishment ... The chaos of persons, ships and buildings was irrelevant, or made no sense to him ... As amusement, some drunken sailors had passed the word around that our companions were cannibals, and there were more and more shouts. A rabble was gathering in the street, and it had turned into more than a bad practical joke." "What we saw left us speechless: a canoe was approaching to starboard; a girl, almost a child, was skilfully stroking the water, first one side then the other, a small fire at her feet. Standing at the bow was a man. He was naked, skinny, with a mass of tangled hair. A sealskin not much bigger than a handkerchief around his shoulders was all that protected him from the wind ... It was Jemmy Button ... There was, as never before, a great distance between him and the whites. This figure barely gave us a glimpse of the Button with English boots and jacket, the London Jemmy of a year ago. In the Captain's eyes, this man who had returned to the most primitive human state ... had kept nothing of what he had been given. He had done nothing. He hadn't played his part. He had civilised no one ... He was the image of his own failure." It is not a long novel, but it has an epic quality, which put me in mind of Melville, of Conrad, even of Mary Shelley's Frankenstein. Perhaps, above all, like Shelley's masterpiece, it is a tragedy of unintended consequences. Most interesting and not unlike some of the Australian experiements. Indeed, Kathryn - I have written elsewhere about Edward Eyre, who I think was considered quite an enlightened governor in Australia, but who became quite the opposite, subsequently, in Jamaica. This "savage" woman of terra del fuego picture of 1797 is the complete opposite of the 1791 version. Completely. This was not the complexion of the original Yamana peoples. It was only due to the extermination of those peoples do you get the lighter version of history. Ironic how the latter seems to be told and not the former.